every moment. I want to take every advantage of the opportunities that come my way. 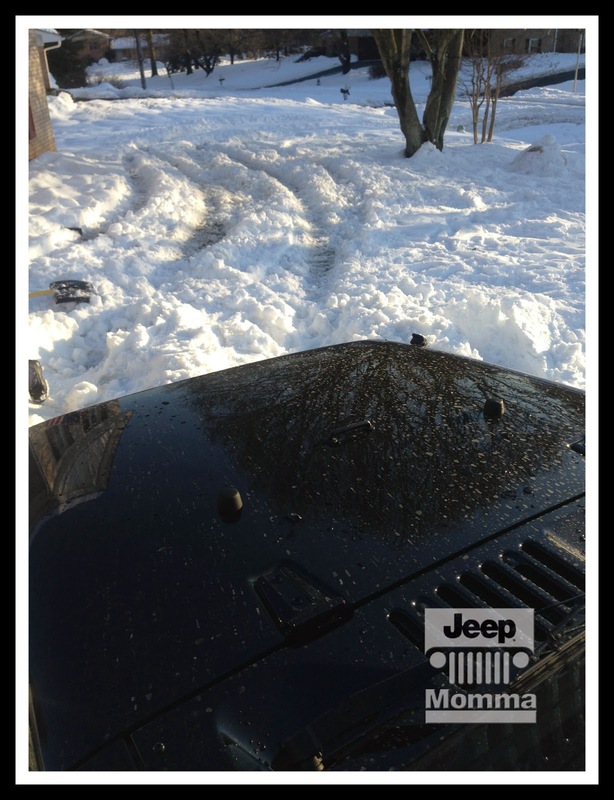 Tuesday I told you about how I put down my 'to do' list to head outside to play in the snow with my boys. They wanted my help building their snow pile bigger. Their goal was to get more speed on their newly built sledding course in our front yard. It felt good to let go of my perceived responsibilities and to spend more time enjoying my kids. We had a lot of fun that day and created fantastic memories that will last a lifetime. Later that day, still feeling "kid-like" I kept eying that snow pile through my kitchen window. It was calling my name -- taunting my inner child. I thought, "how would my Jeep stack up against that pile?" 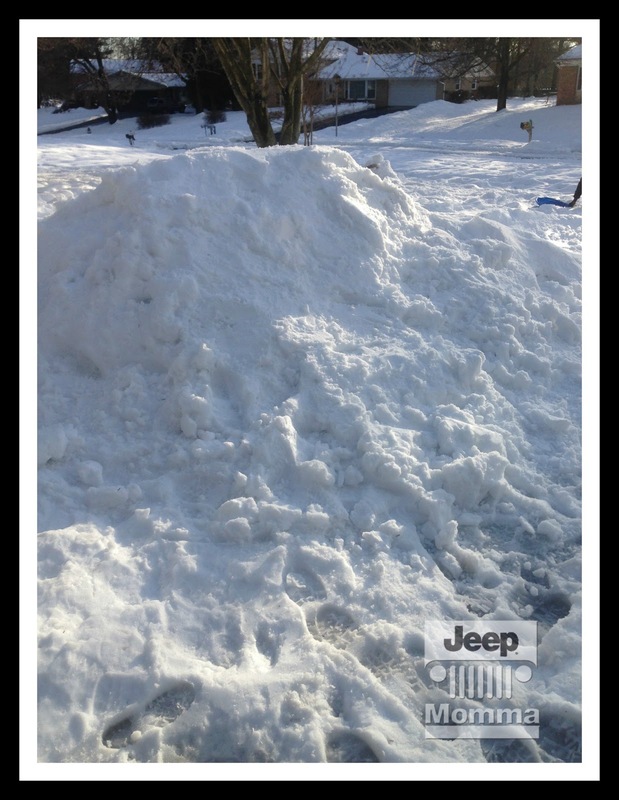 Not wanting to destroy the hard work my kids put into building it, I asked my oldest how he felt about driving my Jeep over their pile of snow. The grin that grew on his face gave me my answer. So we headed out to take on the packed pile of white stuff. My confidence in my driving abilities wavered as I looked at the pile mocking me. I didn't want that pile to beat me especially after my bragging for weeks about my abilities as a driver in a winter's garden. While my kids were taking one last sled run down the course I invited my friend to take a spin around the block. It was her first time out since the 15 inches of snow fell and the plows still hadn't hit our neighborhood. Putting the gearshift in 4X4 mode for me is like being a kid in the candy store -- I just can't get enough. 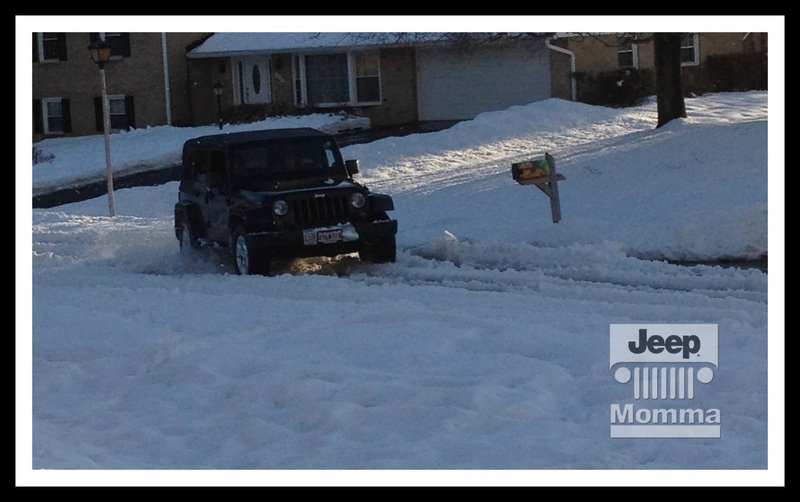 As we pulled into the driveway after our 4 by 4 spin around the block, I was alone in my thoughts -- it was just me and my Jeep -- in a stare down with the pile of snow. I was a little timid at first, only taking a couple of stabs at the pile ever so gently. My son jumped into the Jeep for moral support to cheer me on. Realizing - Hey! You are in a Jeep! Just take it on -- full force. So I punched the pedal. And over I went. I just kept going and going -- straight through the yard. To avoid the Internet box I ended up in the neighbors yard. Then down through the ditch, back out on the road. There were whoops and cheers and lots "Oh Yeahs"! The exhilarating rush of being in control of such a powerful beast had me yearning for more. It was like eating a potato chip, one just isn't enough. My natural instincts and years of Midwest driving didn't fail me. So I took it around again... and again! That's when my husband stepped in and asked for a turn. I was very hesitant to give up the wheel, but thought, I'd better not be selfish. He took it for a couple of spins. Then of course -- you know those "Men drivers", he got it stuck, high centered it. Which means none of the wheels were touching the ground. I believe he did it on purpose. Just so he could have bragging rights, claiming his truck needed to tow my Jeep. So like always having to defend my Jeep -- "It's not the Jeep, it's the driver!" I said. 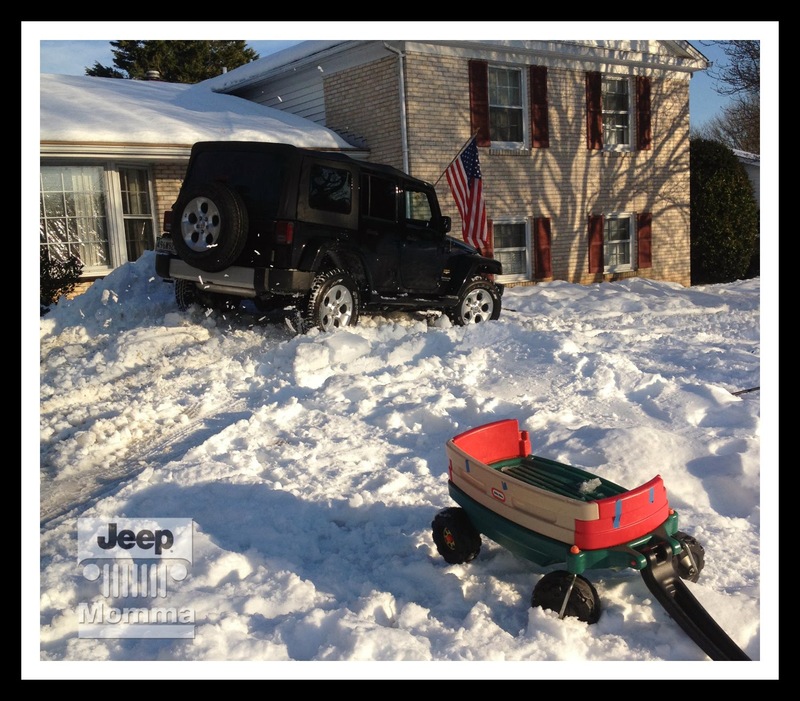 My son even decided that the saying "Beastmode" needs to be replaced with "Jeepmode"! The moment I took hit the hill and went over I decided it's time -- time to seize the moment and enjoy life! 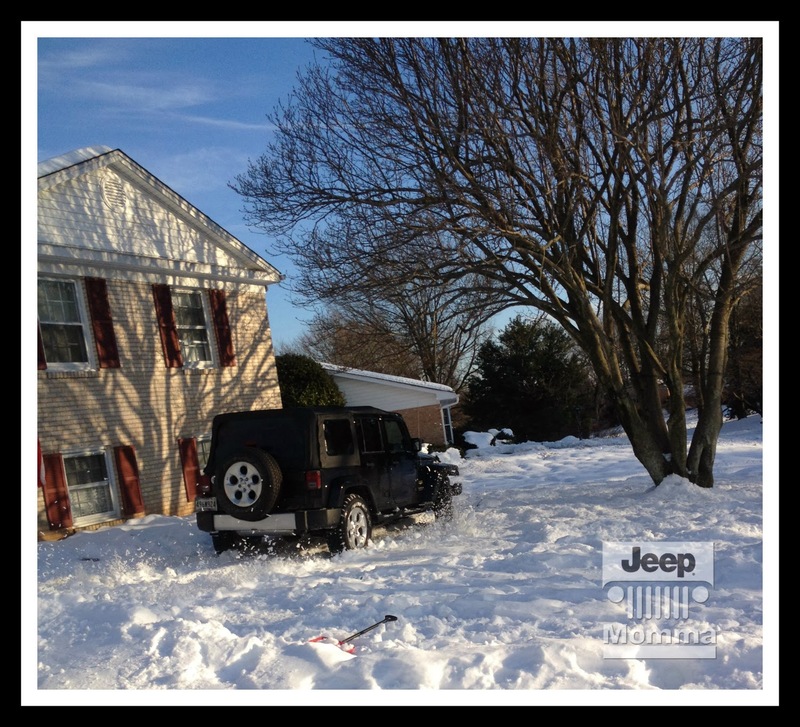 In that moment it didn't matter that I was driving my Jeep in the front yard. If I messed up the lawn we could fix it, grass grows back. I didn't care what it looked like or what my neighbors thought. We were having fun and no one was getting hurt. There is still so much in life I want to achieve, goals I want to complete, dreams to fulfill and ideas to try out. My time to do all these things is growing shorter and shorter as the days go by. So now is my time for action. There are many regrets about not doing some of these things earlier in my life. I let other people's judgements and expectations hold me back. I am not holding back my ideas, projects or attempts any longer for fear of other people's criticisms or judgements. If I want to accomplish my goals, finish my projects and enjoy life I will have to face the reality of other people's negative opinions and criticisms -- that is just the price of admission. Now with our lives prominently displayed for all to see we are all constantly being judged and criticized more publically than before. I will learn to embrace it and take it as a learning experience. I will need to see the difference between those who just want to bring me down and those who are truly wanting to help. Learning how to filter out the disingenuous and cruel comments to learn from the comments that can be used to better myself, my projects and my life. No more excuses -- no more holding back. It's time to take advantage of what I have now and enjoy my life. It's time to listen to my heart and make the best of every opportunity presented to me. 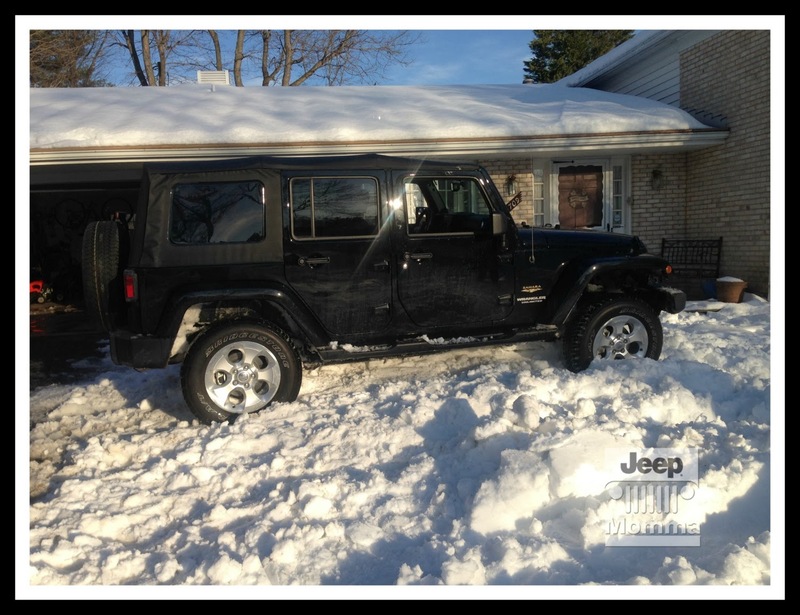 I'm sure there were a few stories about me when I traded in my "mom" car and bought a Jeep. But you know what -- it made me happy. I found a joy that has blossomed into something bigger. I enjoy my Jeep, it's fun and exhilarating and it makes me feel young again. I'm ready to face the world and have fun doing it.